The Geovision 94-NU720-32A, supporting 32 network IP cameras comes with a huge storage capacity of 500 GB System HDD. Powered by advanced multithreading Intel i7 processor and 8 GB of RAM, the NVR comes with fast processing power, enabling it to support multiple-footage recording at comfortable ease. The 4U Rackmount Chassis of the NVR is easy to install and saves considerable space due to its ability to mount on rack. 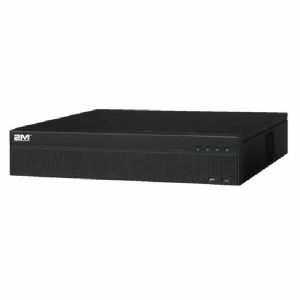 The Rackmount casing also makes the NVR sturdy enough to resist any kind of physical and environmental impacts. The 4/8 Hot Swappable Bay of the chassis ensures that you can upgrade and replace your system according to your needs. The DVR Burner of the system offers you the provision to burn the desired footage on optical drives according to your need. Keeping archive, storing footage and carrying them as and when needed has become easier. On the other hand, the 500 GB of system HDD offers a huge inbuilt storage capacity. The Geovision 94-NU720-32A NVR comes with a two year of extended warranty.